The Saraland Water and Sewer System (SAWSS) is committed to improving the operation efficiency and condition of its water and sewer infrastructure in order to maintain affordable rates while minimizing impact to the natural environment. If you drive through Saraland, it quickly becomes evident the city is growing rapidly. It is a desirable community due to its top rate schools, easy accessibility to industrial jobs along the US 43 corridor and Brookley Field, and its small-town appeal. Specifically, the City is experiencing the most growth north and west along Celeste Road. 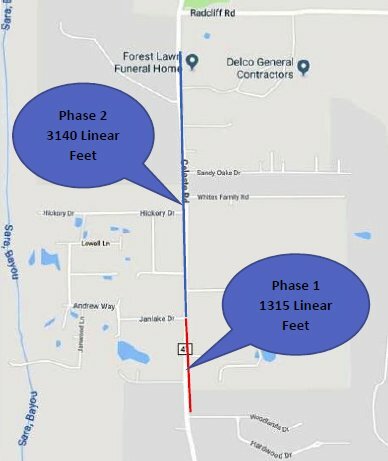 In order to accommodate the growth of new residential subdivisions and other associated commercial growth, the Saraland Water and Sewer Services is in the process of extending a six-inch force main along the east side of Celeste Road. This force main is capable of collecting sanitary sewer wastewater and transporting it to the Saraland Water and Sewer Service’s Wastewater Treatment Facility. The availability of sewer will reduce the number of on-site sanitary sewer septic tanks and will enable the flexibility in developing varying lot sizes. It is wellknown, on site septic systems may not function well in low-lying areas or areas with clay soils. Phase One extended the line 1,314 linear feet on the east side of the road. Phase Two will extend the line an additional 3,140 feet to just south of Radcliff Road. 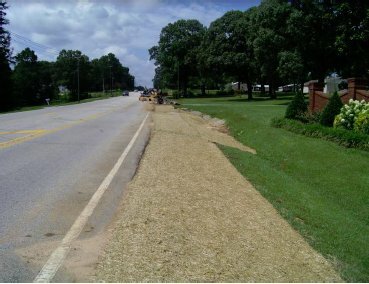 Four-inch stub outs will be installed under the road as necessary to serve existing and future customers. In order to maximize efficiency, the project was installed by the operators and staff of the Saraland Water and Sewer Service with engineering oversight provided by Carah Hall, PE from McCrory Williams Inc. 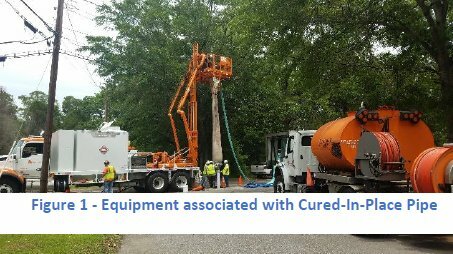 In 2016, the Saraland Water and Sewer Board applied for and received grant funding from Mobile County through it’s Community Development Block Grant (CDBG) Program to install Cured-In-Place-Pipe on Elm, Cypress and Juniper Street. This project installed innovative trenchless technology called Cured in Place Pipe (CIPP) to address inflow and infiltration in aged sewer lines and manholes. Installation of CIPP is very minimally invasive to the natural environment. All work takes place in previously disturbed areas and construction activities take place within existing sanitary sewer trunk line. This project reduced inflow and infiltration through the installation of a new “pipe within a pipe” resulting in reduced collection and treatment costs. This project cleaned the lines, installed 2,400 linear feet of CIPP technology, rehabbed 19 service connection and 10 manholes. The project was competitively bid out and the low bidder was Suncoast Infrastructure, Inc. The total contract price was $154,380 plus engineering design and inspection fees. Mobile County CDBG provided $145,500. Groundwater entering sanitary sewer lines through defective pipe joints and broken pipes is called infiltration. The volume of leakage increases over time due to damage caused by tree roots, faulty installation, and aged materials. Damaged and broken sewer cleanouts are a major cause of infiltration in Saraland. Further, infiltration occurs where groundwater elevation is higher than the gravity sewer line. Water entering sanitary sewers from inappropriate connections is called inflow. Typical sources include compromised manholes, roof drains, and alteration of natural drainage from filling lots for construction. 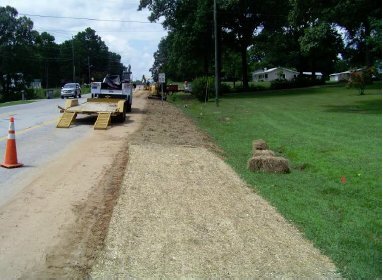 In some areas in Saraland – storm drains have been found to be connected directly to the sewer gravity lines. Inflow tends to peak during precipitation events, and causes greater flow variation than infiltration. The Saraland Water and Sewer System (SAWSS) is committed to improving the operation efficiency and condition of its water and sewer infrastructure in order to maintain affordable rates while minimizing impact to the natural environment. 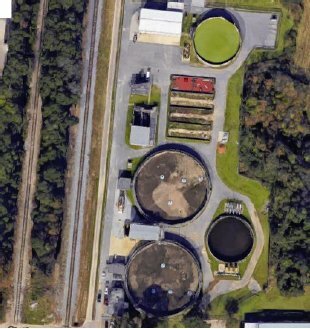 After taking over the wastewater treatment and collection system in 2015 from the City of Saraland, the SAWSS Board asked Carah Hall PE from McCrory Williams and Chad Hennis, Saraland Utilities Director, to evaluate the condition of the infrastructure of the entire treatment plant system. It was apparent during the evaluation that the tanks and basins at the wastewater treatment plant were a top priority as they were in dire need of infrastructure rehabilitation and cleaning due to a great deal of accumulated ragging, sediment, sand and sludge in the bottom of the tanks. 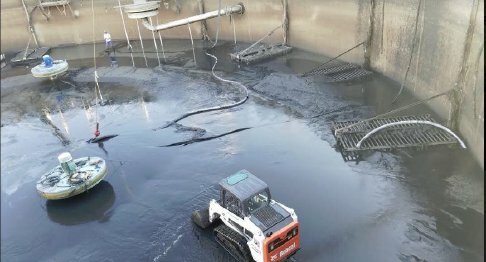 The sludge, sediment and sand accumulated after numerous years of wastewater treatment and caused many problems such as reducing treatment volume and capacity at the Wastewater Treatment Plant. In late winter of 2017, bid specifications were developed to solicit a contractor to clean the north reactor tank. Greensouth Solutions was awarded the project as the lowest responsible bidder. The north reactor tank was temporarily decommissioned and then drained for cleaning. Greensouth removed and hauled off over 70 tons of sludge/ragging material from the north tank (diameter of 70-feet and depth of 20-feet). Subsequently, in the Spring of 2017, to address the remaining tanks/basins to be cleaned, SAWSS bid and awarded a contract to clean the south reactor tank, equalization basin, UV basin and post-aeration basin at the Wastewater Treatment Facility. In order to complete both of these projects, SAWSS expended approximately $250,000 including cleaning, disposal, engineering and construction inspection fees. Following the cleaning operations, interior infrastructure of the north and south reactor basins replacement was deemed as the next order of work. The results of this project were almost instantaneous. The effluent leaving the plant was noticeably clearer and lacked odor. The effluent test results showed significantly less solids and other pollutants entering into Norton Creek and Bayou Sara and ultimately to the Mobile-Tensaw Delta. The Saraland Water and Sewer Board Members and staff are committed to maintaining and improving its infrastructure in order to keep down water rates for their valued customers. In the Fall of 2017, after a large rain event, a sink hole developed in the right-of-way on the north side of Celeste Road – across from the new Bebo’s Car Wash. 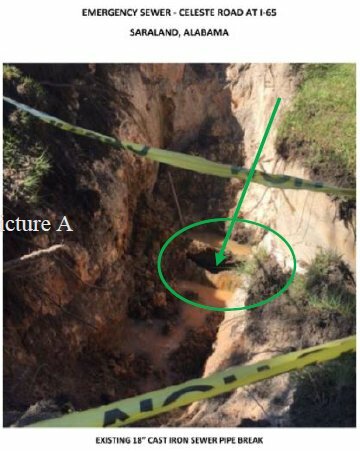 Immediately, the Saraland Water and Sewer Service deployed a crew and excavated the area around the sink hole to identify the cause of the problem. Soon after, an 18-inch diameter cast iron gravity sewer collection line was exposed and regrettably, there was a large hole on the top of the pipe (see picture A). It is unknown how long this hole was there, but due to the significant size, it is presumed to be a contributing source of Infiltration/Inflow (I/I), which adversely impacts the capacity of the collection system, normal lift station operations, as well as the effectiveness of the treatment plant operations. In order to address the extent of the damage, the Saraland Water Board, using the expertise of Carah Hall, PE from McCrory Williams Inc., hired Smith Industrial Service (SIS), a local company who uses innovative technology to assess the condition of underground infrastructure. 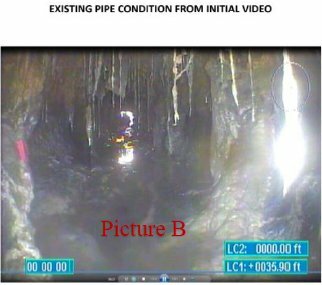 First, SIS ran a camera through the broken line to visually determine the interior condition of the pipe (see picture B). After additional considerations and further evaluations of the video inspection, it was determined that the pipe segment was conducive for a point repair at the break and complete rehabilitation in-place with minimal disruption, using Cured-in-Place Pipe methods. 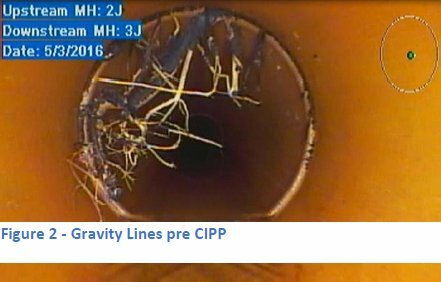 Cured-in-Place Pipe (CIPP) methods uses trenchless technology to install a high-strength fiberglass resin liner inside an existing host pipe. This trenchless technology can rehabilitate aged infrastructure and seal leaky lines without the ground disturbance typically required for the construction of new lines/repair of existing lines. 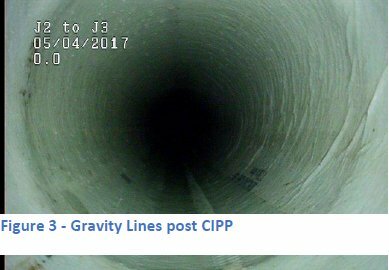 CIPP is extremely cost effective, economical and unobtrusive, as most sewer lines are located under existing roads or in sensitive riparian areas. Therefore, CIPP is an efficient way to extend the useful life of existing infrastructure while decreasing treatment costs due to the elimination of inflow and infiltration. 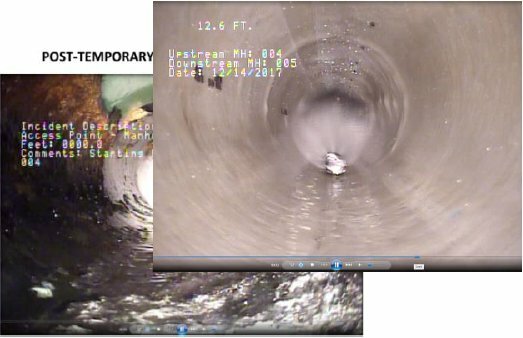 After the point repair was made and during low flow conditions, the Contractor was able to complete the repair by cleaning the existing pipe and installing a new CIPP liner within the existing pipe (see pictures C and D). The cost of the permanent emergency repair, including the temporary emergency repair and engineering, was approximately $100,000. The Saraland Water and Sewer Board Members and staff are committed to maintaining and improving its infrastructure in order to secure adequate sewer service and keep down rates for their valued customers.